What do you call it when something that was already very good gets quite a lot better? Well I guess that would be an upgrade. That’s exactly what happened yesterday when I changed to the new Lithium Ion batteries on my Elinchrom Ranger Quadra kit. 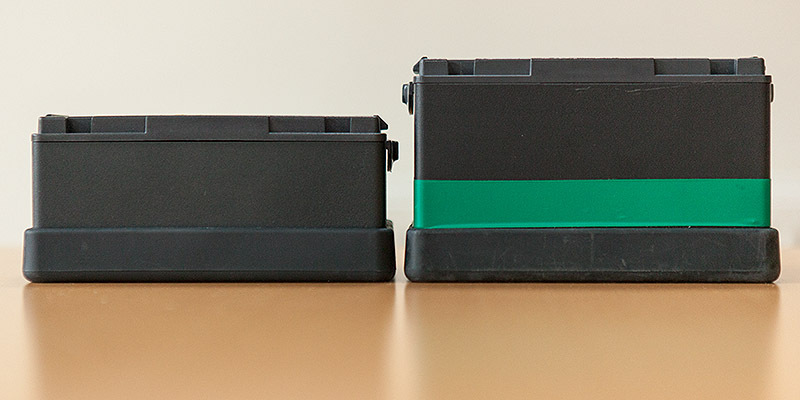 New lithium ion on the left and the old lead gel on the right. Less weight, even in a rolling case, has got be a good thing 99% of the time and I am really looking forward to having to carry less. Of course I have always loved using the pack and battery to weight the base of the lighting stand down when working outdoors. I might have to find a few rocks and bricks lying around to supplement the pack more often that I used to but that’s fine by me. I’ve only managed to shoot two small jobs with them so far and the speed of the recycling is great – even with my four year old Ranger Quadra pack and S heads. Some portraits yesterday afternoon shot indoors and on a lower power setting had the kit recycling in a fraction of a second which made the job go very smoothly indeed. I have yet to try out the new Quadra Hybrid pack which promises all sorts of extras that I don’t think that I need. Elinchrom offer an upgrade to packs as old as mine to get the brighter display but my purchasing decisions these days are made on a perceived need rather than on wanting the shiniest and newest kit. I’ve blogged about this Elinchrom kit before. The first time was in May 2009 when I’d only had the kit a short while. 32 months later I blogged again and, in what has become my most popular posting ever, I gave my considered review of the kit. One of the first comments on that posting alerted me to the new batteries being on their way. It’s taken me twelve months to get around to getting the new batteries and having the small modifications done to the S heads and I’m a happy man. In the “32 months on” review I mentioned a few other things that I’d like to have seen produced to go with this kit. In the last six months I have become less and less pleased with the Skyport remote system that comes with the Ranger Quadra. The original triggers were prone to falling out of the hot shoe and the controls on the mark two version are tough to see in low light. I know that the whole raison d’être of this system is to be small and lightweight but they went too far with the Skyport transmitter – so much so that I’ve gone back to using Pocket Wizard Plus III transceivers a lot of the time at the expense of being able to remotely control the power. So, Elinchrom – I hope that some senior managers are reading this… if you really want to make my happiness complete, can you please produce a transmitter that works with the EL Skyport receiver built into my Quadra pack that takes AA batteries, is about the size and weight of the Pocket Wizard Plus III unit with a digital display that has all of the functionality of the small Skyport transmitter but that is easy to use in subdued light, doesn’t require a tough-to-find button battery and that stays in the hot shoe properly. Pretty please? Did you say they had also halved the price? It just such an expensive upgrade. $$$$ for the battery. $$ to upgrade the heads (I have 2 S Heads and 3 A Heads). I’ve toyed with the idea…but my Think Tank Logistics Manager and Airport Security roll so well that 4lb. doesn’t seem like a lot. Hi Delane – You are right, the weight saving alone wouldn’t have made it work for me either. It really was the combination of the weight saving and needing to replace the four year old batteries anyway along with the increased (doubled) capacity for maximum flashes per battery and the improved recycle times that made me decide to go for it. The cost of the head upgrades here in the UK is around US$30 per head, which isn’t too bad. I find that I need to pick my rolling case up often enough that those few pounds weight do make a difference (my kit is in a ThinkTank Airport Take-Off).